What makes us unique from the rest of creation is our identity—God created us in His image and likeness. As such, God gives us the vocation of being His representatives in the world, for the image of God expresses our connection to Him, also defining our responsibility to the creation. Before our fall into sin, “The Lord God took the man and placed him in the garden of Eden to work it and take care of it” (Genesis 2:15). God gave Adam, a physical being, something physical to do to serve a physical world. Before the Fall into sin, we only knew good. For the serpent told Eve, “God knows that when you eat from it [the tree] your eyes will be opened, and you will be like God, knowing good and evil” (Genesis 3:5). After sin, our vocations became painful and often burdensome (Genesis 3:16-19). 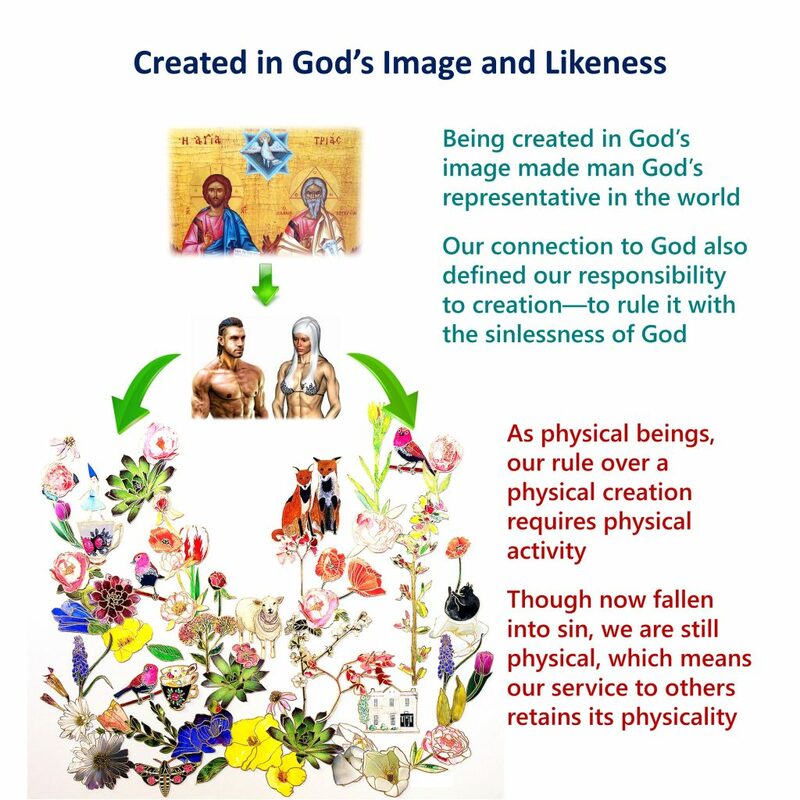 From creation, we learn God works through physical means. For God could have tended the garden without the help of Adam—still, He charged Adam with such a vocation. The same is still true today. For example, when someone we care about is ill, God uses vocation—doctors, nurses, and other health-care workers—to deliver healing. Vocation Defined: God working through human beings, who, in their different capacities and according to their different talents, serve one another. 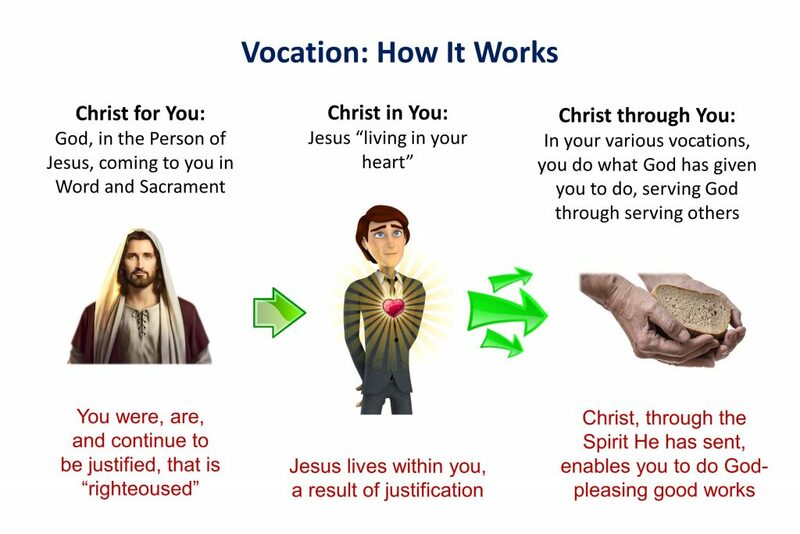 This is the doctrine of vocation. This understanding broadens our focus. Instead of honing in on what God is doing in our lives, we now look beyond to what God is doing through our lives. As God is working through the vocation of others to bless us, He is also working through us to bless others. We then participate in God’s ceaseless creative activity, laboring with Him as He provides and cares for His creation. Through our actions in our works of service, God comes down to earth, transfiguring our everyday lives. The first calling, or vocation, for every Christian is to the Church. Now, this isn’t so every Christian can live a cloistered life away from the world but rather to be and remain “saved” (refer back to Lesson 3). God calls every Christian through the Gospel into the life of faith (Romans 8:30), becoming a member of Christ’s Body, the Church. By our fallen nature, each person is oriented and curved back to himself. He even strives to bend other good things—including not only physical but even spiritual goods—to gratify the self. So, the work of the Church is to point you away from yourself back toward Christ. This is repentance for the forgiveness of sins (Luke 24:47). By grace, God does this by being present for us through physical means: the water of baptism, the bread and wine of Holy Communion, and the movement of vocal chords as the pastor preaches Christ into your ears. No longer needing to justify ourselves because Christ justifies us, we can live in a spirit of freedom. This freedom is focused away from our sinful self, which allows us to look beyond ourselves toward others. This is vocation, for our faith reveals itself by what we do (Ephesians 2:8-10). For you are saved by grace through faith, and this is not from yourselves; it [faith] is the gift of God not from works, so that no one can boast. For we are his workmanship, created in Christ Jesus to do good works, which God prepared in advance for us to do. Using metaphor, who is Jesus and who are we? As Christians, apart from being connected to Christ (the Vine), we (the branches) cannot do anything. We live in the love of Christ so we can serve our neighbor with that same love. Without Christ as the life-giving source, our good works would wither away and die, just like a branch cut off from a vine. In other words, our life of faith, which includes our vocations through which we serve others, is an extension of the Divine Service. During the worship service, in Word and Sacrament, we receive Jesus and His life and salvation. You don’t primarily serve God during worship; He serves you. You serve Him by serving others in your life. The Christian life is a giving life because Christ gave and gives to us. As Christ is present for us in the His Supper, similarly is He present—through us—in our vocations. Ordinary human work now becomes sacramental—not a sacrament, mind you, which is what God does to save and forgive us—but an extension of His work for us lived out in our lives. He uses each of us individually, through the talents and opportunities that He has given us, to bless others. The Christian’s life is hidden with Christ in God (Colossians 3:3). Though true, we still physically live in the same world with everyone else, subject to the same natural laws, living in the same communities, dealing with the same sorts of practical concerns. As a Christian, you are not to retreat from the realm of the ordinary and every day or neglect of the real world in which God has placed you. If so, how could you “love your neighbor as yourself” (Matthew 22:39)? But how do you know how you should serve? Finding your vocation has to do, in part, with finding your God-given talents (what you can do) and your God-given personality (what fits the person you are), and whom God brings into your life. 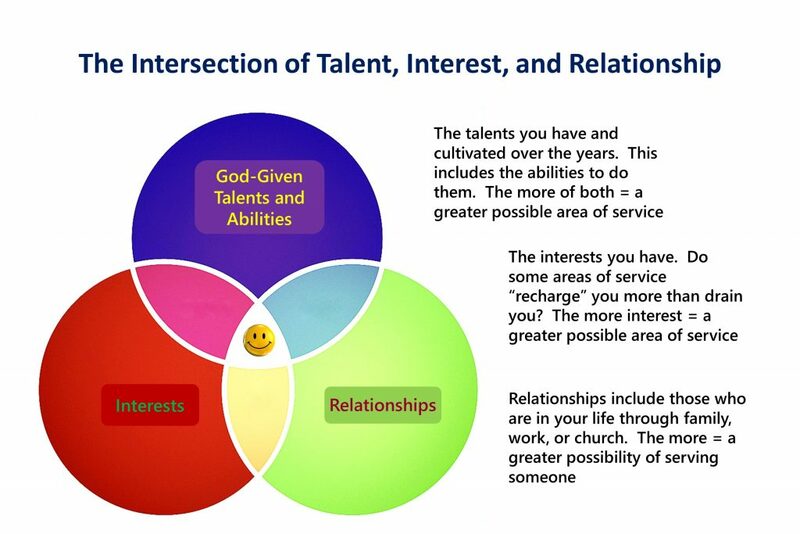 The matrix of these three areas intersects to enable you to understand and decide how and when you should serve. Understanding vocation encourages attention to each individual’s uniqueness, talents, and personality. As valued gifts of God, He creates and equips each person differently for the callings He has in mind for each person. Vocation undermines a stifling conformity, recognizes the unique value of every person, and celebrates human differences. However, it sets these individuals into a community with other individuals, avoiding privatizing, self-centered narcissism, and sin-formed aspirations. An emergency, however, can place you in a situation where you need to act—even if you don’t have the interests or abilities. By being in a place and time where you need to serve, and not doing so would lead to greater harm, you act as best you can. To serve another based on who your neighbor is displayed below. The purpose of your vocations is to love and serve your neighbor. This is the test, the criterion, and the guide for how to judge and live out your vocations. How does my calling serve my neighbor? 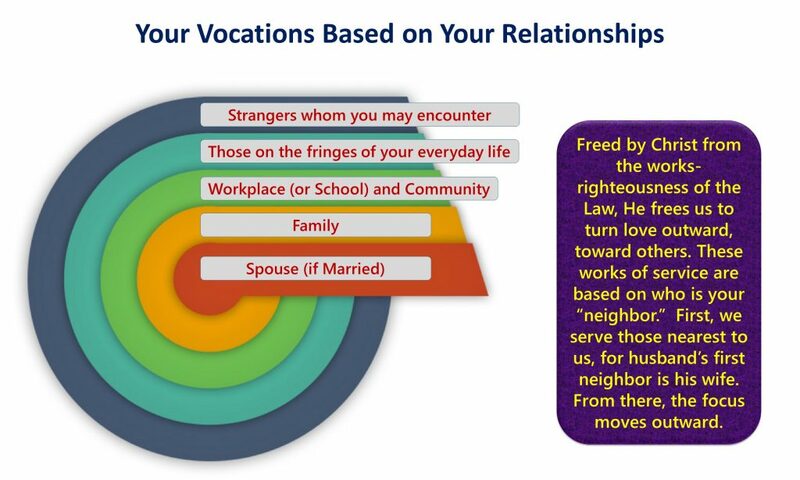 Who are my neighbors in my particular vocation, and how can I serve them with the love of God? “You are a chosen race, a royal priesthood…” “The priesthood of all believers” (better said, being brought into God’s Royal Priesthood) did not turn everyone into church workers. No, you are brought to serve others as God serves you in your salvation. This turns the work you do to serve others into a sacred calling. Jesus rose from the dead and received His heavenly glory. He had His Easter; we have not. For Jesus, the victory over sin, death, and the Devil is history. For us, it still lies ahead (our hope), which we believe to be true (faith). Though the cross and tomb are empty for Jesus, they are not for us. Our lives are now the cross (Matthew 16:24) and glory in the better Day that is coming (1 Corinthians 15:53-56). God gives us faith, with which we respond back to God in prayer, praise, and thanksgiving. However, our works are for our neighbor. For if you try to do some deed to make yourself right with God, you turn your works into an idol, because you trust in them as having some saving benefit added on top of Christ’s. “Everything that is not from faith is sin” (Romans 14:23). So, we do not ascend to righteousness by what we do. No, righteousness descends to us by the grace and doing of our gracious God. From His righteousness, we then are moved to serve others because our salvation does not depend on it. Our God frees us to risk because our Christ has already given us our status before God. Our vocations are an extension of the Gospel, a manifestation of God’s action for us being lived out through us. Our vocations are not another burden placed on us or another area in which we can fail. Freed in Christ, they become a realm in which we can experience God’s love and grace, both in the blessings we receive from others and in the way God is working through us despite our sins, weaknesses, and failures. Next week is the last in this series: Being fully human in eternity.